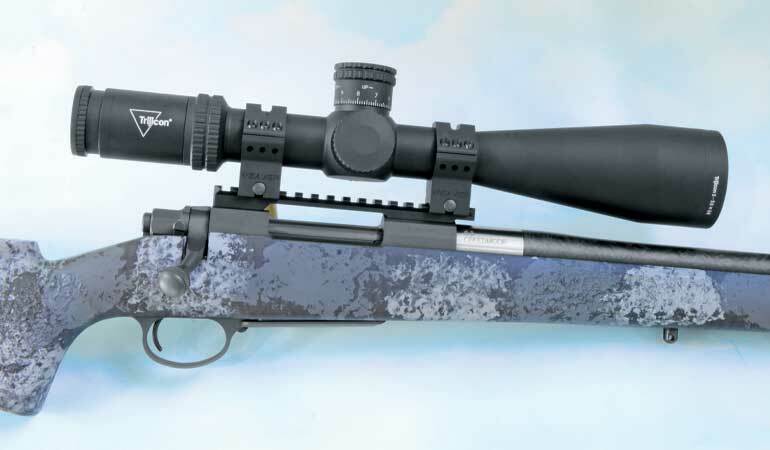 Nosler introduced the Long Range version of the Model 48 rifle in 2017, and it was an immediate success. Its bestseller, the 6.5 Creedmoor, is on the Model 48’s short action while the .26 Nosler, .28 Nosler, .30 Nosler, .33 Nosler and .300 Win. Mag. are on the longer action. The weight of the short-action rifle is around eight pounds, and with a carrying sling, magazine full of cartridges and one of the huge scopes loved by many of today’s hunters held steady by a Picatinny mount, it pushes 10 pounds. That’s great at the bench and just fine for leisurely stalks in relatively flat country, but it is a bit much for climbing tall mountains every day for a couple of weeks. There are several ways to lighten a rifle, with one being the use of a soda straw-thin barrel. The thinner the barrel, the lighter the rifle becomes, but the barrel also loses a lot of its stiffness and accuracy can suffer. Chopping the barrel back to 20 inches or so sheds even more ounces, but velocity loss is great. A better option is to shed a pound by installing a 26-inch, carbon fiber-wrapped barrel with a Sendero Light contour from Proof Research. And that is precisely how Nosler transformed the old Model 48 Long Range into the new Model 48 Long Range Carbon. But before going there, let’s see what the new rifle inherited from the old. The new rifle obviously has the Model 48 action, and since it has been reviewed in RifleShooter more than a few times by myself and others, I won’t bore you with yet another retelling. The action and the aluminum bottom metal have a Cerakote finish in Sniper Grey. The action and the aluminum bottom metal are Cerakoted, and the carbon-fiber Manners MCS-T Elite Tac stock sports a durable camo finish—with textured panels for a non-slip grip. Nosler has used several different triggers through the years, and this one has a fully adjustable Timney with a two-position safety that, when engaged, allows the bolt to be rotated for loading and unloading the chamber. The safety can be pushed off quietly, and that’s an important detail to look for when shopping for a big game rifle. Ten pulls on a Lyman digital gauge averaged three pounds, 14 ounces, with a variation of only three ounces. Each pull was extremely smooth, with no detectable creep or overtravel. Torx-head bolts at the front and rear of the receiver secure the barreled action to a Manners MCS-T Elite Tac stock. The stock is made entirely of carbon fiber and has the extremely durable Elite Midnight Camo finish. Textured panels on both sides of the wrist and fore-end offer a non-slip grip for when your hands get wet or muddy. The flat-bottom fore-end snuggles nicely into a sandbag, and yet measuring 1.940 inches at its midpoint, it is narrow enough for a comfortable fit with the hand. Due to a sharp downward slope of the Monte Carlo-style comb, the stock slides away from the shooter’s cheek during recoil, and that increases the comfort factor. The shape also works nicely with various scope mounting heights. When shooting the rifle, I used a Trijicon AccuPower 5-50x56mm scope in Weaver 34mm tactical rings and a Talley 20-m.o.a. Picatinny base. A light cheek weld on the stock positioned my eye dead center of the exit pupil of the scope. Curious to see how compatible the stock would be with lower scope mounting, I tried an old faithful Nikon Monarch 4-16x50mm with Talley one-inch, medium-high rings, and the fit was quite comfortable with it as well. A clearance notch at the front of the comb allows the bolt to be fully retracted and even removed without dinging the stock. The wrists of synthetic stocks on Nosler rifles tend to be thicker than my medium-size hand prefers, and the Manners stock is no exception. It begins with a circumference of 5.5 inches near the receiver and then abruptly swells to a much larger handful. Out back, a cushiony Pachmayr Decelerator recoil pad does an excellent job of soaking up recoil. Posts fore and aft accept quick-detach sling swivels and a third post up front is for bipod attachment. When I was shooting the rifle wrapped in a sling from the sitting and prone positions, the extra post interfered with my forward hand placement, so if the rifle was mine I would remove that post. A quick-detach sling swivel attachment point on my Harris folding bipod eliminates the need for it. As I mentioned earlier, the new Model 48 variation has a carbon-wrapped barrel made by Proof Research. Barrels with threaded shanks arrive at Nosler where they are chambered, headspaced and installed on Model 84 actions. Chambering options and their twist rates are 6.5 Creedmoor and .26 Nosler (1:8), .28 Nosler (1:9) and .30 Nosler, .300 Win. Mag. and .33 Nosler (1:10). The rear stainless steel section of the Proof Research barrel is left long enough to serve as the barrel shank, with a bit of room to spare. A slow inspection tour through the barrel with a Lyman Borecam revealed extremely smooth button rifling. My suspicion that it had been hand-lapped was confirmed by Nosler. The barrel free-floats in the stock. 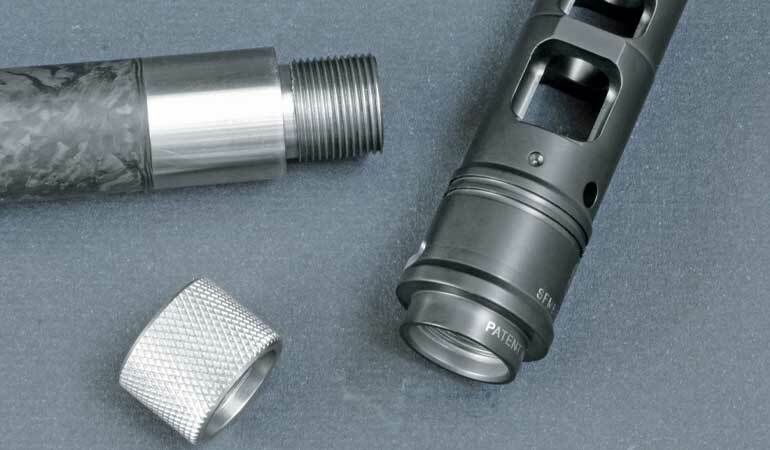 For the benefit of those who are not familiar with the Proof Research barrel, it begins by turning down an unrifled barrel blank of 416R stainless steel to an extremely small diameter—leaving short, unturned sections at the front and rear to form opposing shoulders for containing the carbon-fiber wrap. The rear section is made long enough to serve as the threaded barrel shank with a bit of room to spare while finished length of the front section depends on whether or not the muzzle is threaded for a brake or suppressor. On the Nosler rifle it is 1.42 inches long, including a 5/8x24 threaded section. A thread protector is included. The company sent me the optional brake, which is made by Surefire. It has two large exit ports on each side, and it comes with a shim/spacer kit to ensure proper rotation of the brake during installation. Unfortunately, the threads on the brake Nosler sent were not compatible with the threads on the barrel. I tried to get a replacement in time to make the deadline for this article but was unsuccessful, so I cannot comment on the brake’s performance. The barrel blank is then filament-wrapped with carbon fibers impregnated with proprietary high thermal-conductivity matrix resins that were developed by the aerospace division of Proof Research. After curing, the exterior of the barrel is ground to its finished contour and the bore is button-rifled. Claims made for Proof Research barrels include that they’re up to 64 percent lighter than an all-steel barrel of the same contour and length. They promise to provide match-grade accuracy, extended barrel accuracy life through rapid heat dissipation, excellent damping qualities and increased stability resulting in no bullet point of impact shifts during high-volume strings of fire and extreme durability. I am told the company’s carbon-fiber barrel technology is the only one to be approved by the U.S. military for use on precision sniper rifles. So does the barrel really heat up more slowly and cool down more quickly than an all-steel barrel? I first found the answers to those questions several years ago while shooting a rifle in .308 Win. built by Proof Research. Ambient temperature during the tests was 84 degrees. After firing 20 rounds nonstop, I opened the bolt and inserted the 10-inch probe of a thermometer into the barrel from its muzzle end and got a reading of 178 degrees. After 10 minutes had elapsed, barrel temperature had dropped to 134 degrees. I then fired 20 rounds in an all-steel barrel with a muzzle diameter of 0.610 inch and the thermometer read 216 degrees. After being allowed to cool for 10 minutes, its temperature was 161 degrees, which was almost as hot as the Proof barrel prior to its cool-down period. The same test was performed on the Nosler rifle. Ambient temperature was close to the same as during the previous .308 tests. 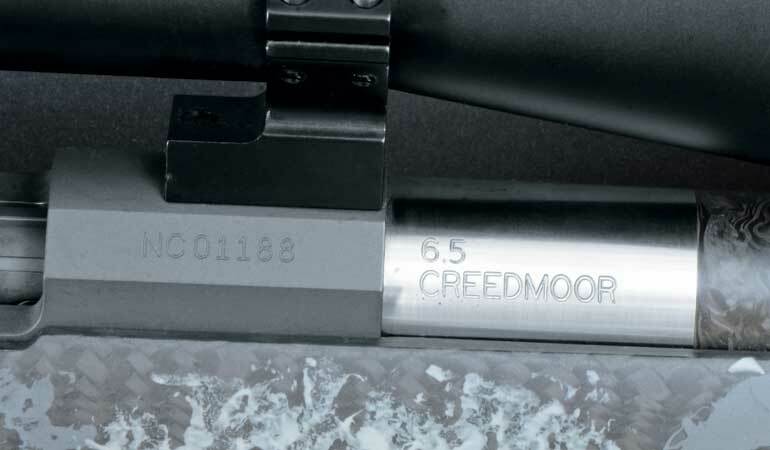 When loaded with a 140-grain bullet, the 6.5 Creedmoor burns a few grains less powder than the .308 Win. loaded with a 165-grain bullet, but I figured that was not enough difference to matter. And I was right. At the end of 20 rounds, the barrel temperature of the Nosler rifle was 172 degrees. Ten minutes later it was 120 degrees. Regardless of what material a barrel is made of, the cooler it becomes, the more slowly it sheds heat. At 20 minutes, barrel temperature was 106 degrees, and it was 99 degrees at 30 minutes. While I was shooting the Proof Research rifle, heat waves off the barrel became quite noticeable in the 10X scope at round 10, and they began to interfere with aiming by the time I reached 20 rounds. It was the same story with the Nosler rifle, and yet I still managed to keep average group size close to a half-inch with Black Hills Gold ammo loaded with the Hornady 147-grain ELD-Match bullet. The two Proof Research barrels I shot had several things in common. For one, both delivered their best accuracy when thoroughly cleaned every 20 to 30 rounds. When the Nosler rifle eventually failed to respond to cleaning as it had previously done, a Lyman Borecam revealed random streaks of ironed-in powder fouling. The 6.5 caliber bore brush was near the end of its life, and switching to a new one removed the fouling and restored accuracy. There was very little copper fouling, and when a trace eventually appeared it was quickly removed by two applications of Barnes CR-10. I do not recall shooting a single group from a Proof barrel that had what could be considered a serious flyer. Beginning with a cold barrel, group size with a particular load usually stays about the same for 15 rounds. If at that point the barrel is not allowed to cool down, group size gradually increases, but bullets still impact in fairly uniform clusters. And there is seldom much difference in the averages of three- or five-shot groups, with group sizes for the first 15 rounds usually close to the same. For example, the first three five-shot groups fired with Black Hills Gold in the Nosler rifle measured 0.492, 0.410 and 0.496 inch in that order. The fourth group measured 0.624 inch for a four-group average of 0.510 inch. From this hunter’s point of view, the biggest thing this type of barrel has going for it is uncommon durability and tremendous stiffness that enables it to shed mishaps in the field. It is as light as a fairly slim all-steel barrel while being as rigid as the fat all-steel barrel of a target rifle. The length of the front, stainless steel section is 1.420 inches, including a 5/8x24 threaded section. A thread protector is included. I love hunting from horseback and through the years have done so in some of the steepest, roughest elk country the West has to offer. I have experienced a few close calls but nothing serious enough to write home about. A friend of mine has not been as lucky. While on a moose hunt his steed lost its footing on a narrow, icy trail and rolled and tumbled down the rocky side of the mountain. Horse and hunter got through it with only minor scrapes and bruises, but the barrel of the Weatherby Mark V he was carrying in a thin leather saddle scabbard strapped to the horse was bent badly enough to put the rifle out of action. I am convinced it would take a lot more punishment than that to damage the Nosler rifle with its Proof Research barrel. Finally, how does the weight of the Model 48 Long Range Carbon compare with other Nosler rifles I have shot recently? 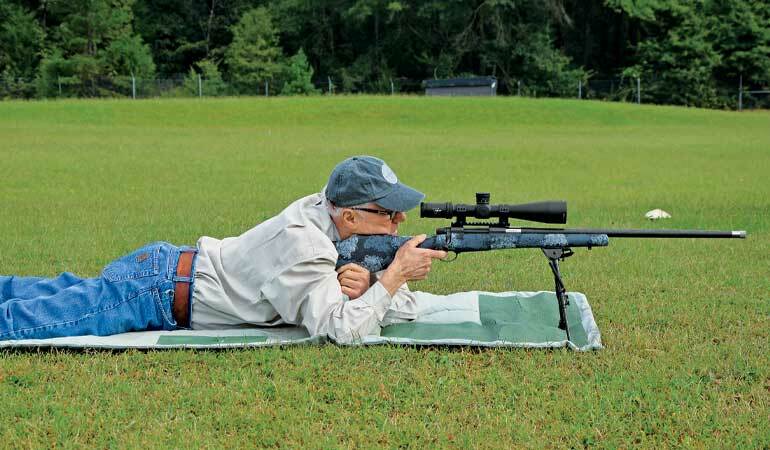 Fresh from its box, the 6.5 Creedmoor featured in this report weighed three ounces beyond seven pounds on a digital postal scale. A Model 48 Liberty with a thin 24-inch all-steel barrel in 7mm-08 I used last year on a Utah mule deer hunt was an ounce lighter. A Model 48 Liberty with a Shilen 26-inch, magnum-contour barrel in .27 Nosler (a new caliber the company is looking at) I am preparing for a hunt as this is written weighed 7.75 pounds fresh from its box.